Picture this. You get home from a long, tiring, frustrating day at work and your laundry is piled up, your house is a mess and supper needs to be made; in which you get no assistance. Or maybe this is more typical in your house; you spend all day cleaning, preparing a delicious meal for your family and the minute they walk in the door coats are flung on the floor, backpacks thrown on the couch and everyone heads to their room to grab their electronics; totally ignoring your clean house and meal on the table. I'm guessing every woman reading this can relate. So what is the impending result? Anger, words spoken in frustration, yelling, possibly some tears. And that my friends, sets the tone for the entire evening. Do you realize that you have the power to change the atmosphere of your home? 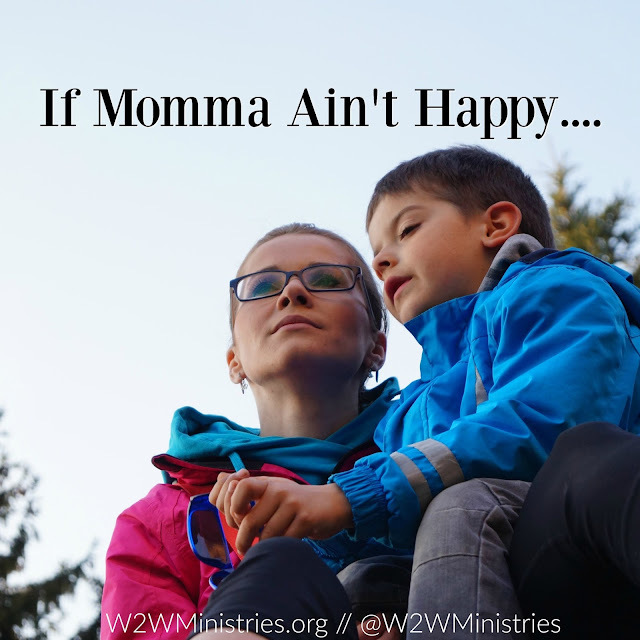 The saying, "If momma ain't happy ain't nobody happy" is a very true statement! Instead of taking a break and asking God for wisdom and strength, often times our stress is unfairly taken out on our kids and our spouses. I am guilty! The words that we speak in anger have the ability to change the mood of our home and have the strong potential to shape our children into who they become. Should they respect the house rules?Absolutely! Should they use the manners that we have worked so hard to instill in them? That's a no brainer, of course! But its our job to be aware of how we respond to these frustrating situations. The Bible tells us that words spoken in anger are foolish. It also tells us that a soft answer turns away wrath but anger stirs up dissension. Sometimes we forget that we represent Christ to our children. If my kids always see me angry and irritated, speaking unkind words and not using wisdom in my responses; that teaches them it is acceptable to act that way and it paints an inaccurate view of Christ. If I claim to love Jesus but I can't stop yelling and harping on their tender souls, I am not representing Him well. A few weeks ago before school started I had an issue with my teenager and I was very harsh about it, sending her out the door to face her day in tears. As the day went on I felt worse and worse and even though we don't encourage texting while she is at school; I took the initiative and sent her an apology. I didn't back down on my stance on the issue that started the debate, but I admitted that my response was wrong. I believe that our kids need to see us apologize. I believe when they see parents asking forgiveness, it does something powerful and speaks volumes. Kids are vulnerable, they are fragile and guess what....they WILL mess up. Just like we do on a never ending basis. But the grace of God far extends beyond our daily mistakes. And our children need to know that our love for them far extends their mishaps as well. Learning to respond instead of react is a very valuable lesson. Maybe that means we need to take a mom time out and read some scripture. Maybe it means preparing yourself before you walk in the door or before everyone comes home; formulating a gentle response to whatever comes your way.And most importantly, it means daily asking God for strength. Daily asking God to help you be the mom and the wife that your family deserves. Asking God to give you wisdom and discernment in your speech and actions and continually refreshing ourselves in the word. One of my favorite sayings in regard to parenthood is; "It is easier to build up a child than it is to repair an adult. Choose your words wisely." If you're human, you have messed up in this area. But you can start fresh. You can begin TODAY! My prayers are with every mom who reads this; mommy-hood can be hard, but it is the best job you'll ever have. I think this post was written just for me. My dad was in the hospital recently. After spending all day there, when I came home I was so exhausted. The nights I was just quiet and appreciated what had been done by others was much better than the nights when I complained about what they had done. I pinned this post so I can refer to it often.